Security Council overwhelmingly rejects Russian resolution calling for condemnation of "aggression" by U.S., UK and France against Syria. 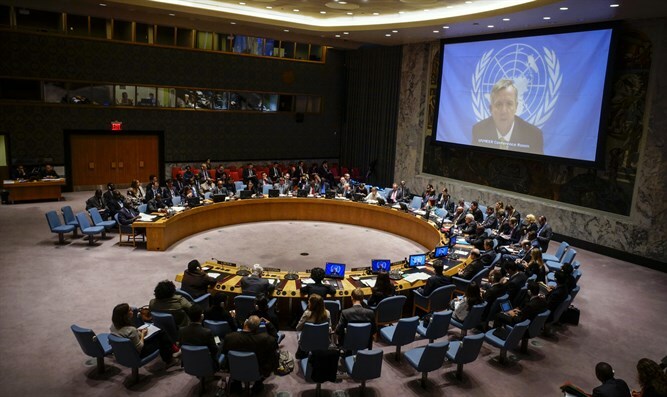 The UN Security Council on Saturday overwhelmingly rejected a Russian resolution calling for condemnation of "aggression" by the United States, United Kingdom and France against Syria, The Associated Press reported. Russia submitted the resolution in the wake of the joint attack by the three countries on targets in Syria. The strike came in response to Syrian President Bashar Al-Assad's recent use of chemical weapons against civilians in Douma. Russia's demand for condemnation and an immediate halt to "aggression" and "any further use of force" by the three Western allies got support from only two other countries on the 15-member Security Council - China and Bolivia. By contrast, eight countries voted against the Russian draft - the U.S., UK, France, Netherlands, Sweden, Kuwait, Poland and Ivory Coast. Four countries abstained - Ethiopia, Kazakhstan, Equatorial Guinea and Peru. At the meeting, the fifth in a week on chemical weapons in Syria, Russia and its supporters again clashed with the U.S. and its allies over the poison gas attack on April 7 in the Damascus suburb of Douma. The U.S., UK and France said they launched airstrikes against Syrian chemical sites after obtaining evidence that a chemical weapon was used by Assad's government. Russia, which on Friday claimed the attack had been staged by Britain, insisted that no evidence of chemical weapons use exists in Douma. Speaking at the meeting, U.S. Ambassador Nikki Haley told the council "there is clear information demonstrating Assad's culpability." She added that President Donald Trump told her Saturday morning that if the Syrian regime uses poisonous gas again "the United States is locked and loaded" to strike again. "When our president draws a red line, our president enforces the red line," Haley stressed. "The United States of America will not allow the Assad regime to continue using chemical weapons." Russia's UN Ambassador Vassily Nebenzia said the meeting confirmed that the U.S. and its allies "continue to put international politics and diplomacy in the realm of myth-making - myths invented in London, Paris and Washington." "We put facts contrary to your myths," he said, according to AP. "If we continue on this path, we will soon reach the diplomacy of the absurd." Russia, which is Assad’s close ally, has continuously protected Assad from UN action against his regime. Last week, Moscow vetoed a U.S.-drafted Security Council resolution that would have set up an investigation into chemical weapons use in Syria following the Douma attack.